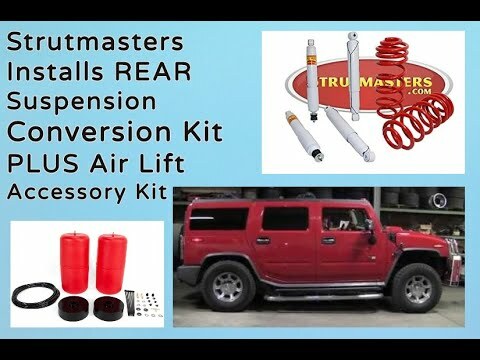 Strutmasters 2003-2009 Hummer H2 Air To Coil Spring Conversion Kit is the perfect solution to your air suspension problems. Designed to be very affordable, you can convert your ENTIRE air suspension to use passive coil springs for less than the price of replacing just ONE Original Equipment air spring. 2003-2009 Hummer H2 Rear Air Suspension Conversion Kit 2WD 4WD (HA1R0) is the perfect solution to your air suspension problems. Designed to be very affordable, you can convert your air suspension to use standard. The air suspension system on the Hummer H2 is an assortment of expensive parts and components that must work in perfect harmony. If just one of the dozens of components fails, the entire system will no longer work. Experienced technicians tell us a complete overhaul of the system is the best hope of a successful repair. 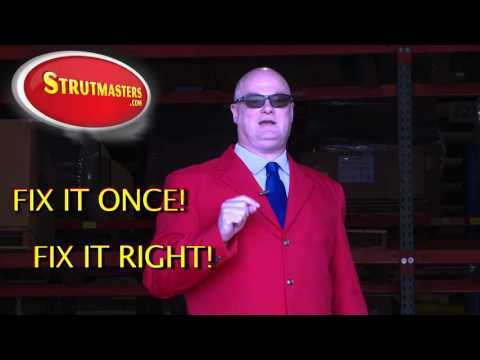 Instead of spending thousands to replace the air suspension system part by part, Strutmasters offers a money-saving way to Fix It Once, Fix It Right. The Strutmasters conversion kit eliminates the need for all those high-dollar electronics required for the system to work. Our custom-tuned passive steel coil springs go right in place of the air springs and can be installed in about an hour per side. Our premium coil springs come closer to the original factory ride quality than any other kit on the market. All of the Strutmasters conversion kits are designed, assembled, sold, shipped and serviced at our family-owned facility in North Carolina. Detailed instructions, videos and access to our tech support means a lot of our customers can do the job themselves and save even more! How Do I know If My H2 Air Suspension is failing? A sudden loss of three to five inches of ride height in the rear of the vehicle is the most obvious sign of trouble. Millions of up and down motions and dry rot due to age causes tiny cracks to form in the rubber portion of the rear air springs. This lets air leak out of the system on your 2003 to 2009 Hummer H2 and causes the vehicle's onboard compressor to run overtime. Eventually, once the cracks get large enough, the compressor can no longer keep up. When the compressor overheats and shuts down, the air springs deflate and drop the rear of the vehicle three or so inches. If this happens intermittently, it is probably due to the compressor shutting off to cool down. At some point, it will no longer be able to make enough air and full failure will be in effect. Another sign of trouble is an illuminated suspension warning light in the instrument cluster. Unfortunately, when any of these events occur, a big repair bill is right around the corner. = TOTAL: Over $1941 (and that doesn't even include replacing electronic components that are known to fail such as the height sensors). 2003-2009 Hummer H2 Rear Air Springs (x2)- (models with air suspension only). Commonly referred to as air bags, a plastic and rubber bladder that uses pressurized air as a cushion to support the rear of the vehicle. The rubber air springs take the place of a traditional steel coil spring used on most other vehicles. Tiny cracks in the rubber portion of the air springs are the number one cause of all air suspension leaks. Since all air springs go bad at about the same rate, if one is leaking, the others will not be far behind. For a proper repair, all of them need to be replaced at the same time . 2003-2009 Hummer H2 Shock Absorbers (x4)- Metal tubes filled with gas-charged hydraulic fluid to control bouncing motion and dampen vibration caused by travel on rough road surfaces. 2003-2009 Hummer H2 Compressor Assembly- Creates and sends pressurized air to the air springs. When the air suspension starts leaking, the compressor (also known as an air pump, has to start working harder to try to keep the system inflated. By the time air suspension leaks down completely, the compressor has normally failed completely or damaged to where it can't keep the system at full PSI. 2003-2009 Hummer H2 Height Sensors (x4)- A linkage located near each wheel that constantly measures the height of the vehicle and reports this information back to the suspension control module. The ride height sensor is a moving part and eventually they wear out. 2003-2009 Hummer H2 Suspension Control Module- This vehicle is equipped with a computer known as the suspension control module. This module is the brain of the suspension system and it reads all of the signals that are being sent by the height sensors and determines if the vehicle needs to be raised or lowered. 2003-2009 Hummer H2 Rubber O-rings- Although they are the least expensive parts of the air suspension, they are responsible for maintaining the seal where all of the air lines connect. Be sure to replace the O-rings when repairing any air suspension system. leaks on my Hummer and paid high prices to dealerships to replace them. Finally I found your conversion kit and online video instructions. It was so easy even this first time female fixer did it herself in one day. (With a little husband supervision). Received the kit within a week. Installed it in two days. No more sagging rear suspension! Works great! My rear air suspension went kaput and the dealer wanted $2500 to replace just the air compressor or about $1000 to convert to coils. Both prices are ludicrous! Thank goodness I researched and found StrutMasters! I was worried when I purchased the springs because I didn’t know how difficult it would be to do it myself, but I have to say that it wasn’t bad at all. I had both installed in a matter of 2-3 hours. The ride is great and the rear is off the stops. Thank you STRUTMASTERS!!! I just installed the Kit in my 2007 Hummer H2 SUT and will say that if I had not known that the suspension system was broken before, I´d never known the difference… now that the coils were installed. Wow! Great job and at great savings! “I have a 2003 H2, took it to the dealer and was told the whole compressor assembly needed to be changed, as the compressor has a huge crack in it, they gave me an estimate of $4500 CDN, I then came to strutmasters.com to look for an alternate to air spring, well let me tell you I spoke to Fred who was very knowledgeable and he guided me with the right coil springs, I also decided to change all 4 shocks, the vehicle drives better than ever, it is nice and high and total cost $800 CDN with install, the shipping was fast and I was on the road in a very short time. “Just wanted to thank you for all your help converting my air suspension Hummer to coil springs. The beast actually seems to corner and ride better with the coils. The $297 I spent sure as hell beats the $2900 they wanted to replace the air system. When following your directions the entire job took less then 90 minutes, including mounting the 8 lug tires back on the truck. Will recommend your company to everyone. Please send me a catalog of all your products. It was great doing business with you and your company. After air bag and compressor issues on my 2006 Hummer H2, I decided to start shopping for coil spring conv. Kits. Found the right kit at the best price from strutmasters.com. the springs went in without a problem, the ride height is perfect, and the truck handles like new! Oh yeah, I never have to worry about air suspension issues again. Problem solved!! !